Joe been a member of the Alive Crew for 7 years. 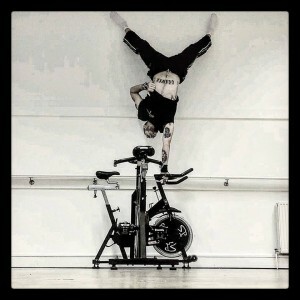 Joe started young in the fitness world, taking up gymnastics at the age of 7, winning several competitions by the age of 11, when he was forced to retire through injury. He has since dabbled in basketball, football and martial arts until he developed a love/hate relationship with long distance running, completing several marathons and shorter distances. He regularly creates crazy challenges for himself to raise money for his favourite charity, Macmillan Cancer Support. These include performing over 1700 burpees and separate 24 hour spin bike and running challenges, raising thousands of pounds. Joe completed his personal training qualification in 2012, with certificates in indoor cycling, gym based boxing and nutrition. If you would like more information on his Personal Training & Sports Massage click on his logo to be taken to his website. A circuit training class incorporating kettlebells, free weights, battle ropes, and bodyweight exercises. The mixture of cardio and weighted exercises will blast fat and sculpt muscles. In this class, you will work up a sweat; improve your physique and muscular endurance. Buy a Class Pass to save £££ for more information on our classes go to Fitness Classes.